On Tuesday 5 June, we marked the launch of the brand new Reading Well for mental health booklist with an exciting event at the Wellcome Trust in London. Guest speakers from all aspects of the programme gave us their unique perspectives on the scheme, including author Matt Haig, funder Mags Patten from Arts Council England, SCL (Libraries Connected) Past President Neil MacInnes, and co-production partners Catherine Wilton and Katie Clarke-Day. There was an excellent turnout of dedicated authors, publishers, health partners and librarians from up and down the country. 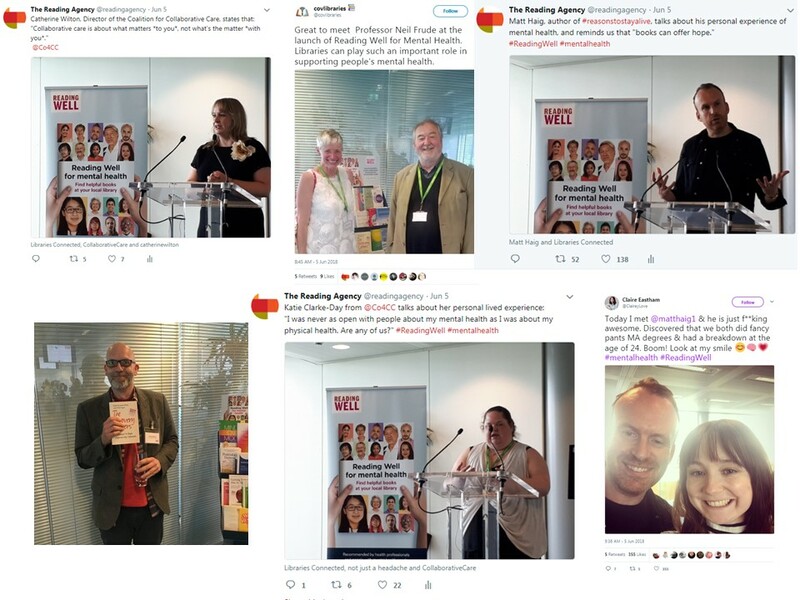 Here are a few snapshots from the day – browse #ReadingWell on Twitter to see more. The new booklist is part of the Libraries Connected (formerly Society of Chief Librarians) Universal Health Offer and provides helpful advice, information and support for people living mental health needs and their carers, or dealing with difficult feelings and experiences. The booklist of 37 titles covers self-help, psycho-education and memoir on a range of common feelings and experiences including stress, depression, anxiety, sleep problems and low self-esteem. Libraries across the country were also unveiling the new list during launch week, both on the ground and on social media. Islington libraries hosted a local launch, with guest speakers Suzanne Lee from community arts organisation All Change and our very own Debbie Hicks from The Reading Agency, which was well attended by local residents, councillors and health partners. Coventry libraries produced an amazing YouTube video advising library users on how to access the scheme, and will be officially launching Reading Well for mental health during Health Information Week as part of their Mental Wellbeing Festival on 5 July. The event will host free information stalls from local health and wellbeing organisations to increase awareness of services in the local community. Meanwhile, libraries from Norfolk to Newham, Poole to Pimlico, and Luton to Lymington took to Twitter to showcase their shiny new Reading Well for mental health displays. All of the books on the new list are available in digital format, and Halton libraries are giving the scheme’s accessibility an extra boost by making several of the titles available via their free ebook service. Back in London, it was a busy launch week for the Reading Well team, who participated in a panel discussion on Friday 8 June as part of The Power of Poetry event at London’s Creativity and Wellbeing Week, hosted by London Arts in Health Forum. After hearing from brilliant new poetry anthology for new mums, Tea and Toast, and the Taking Note poetry project in Cambridge hospitals, the team spoke to poet, teacher and child mental health specialist Wendy French and child psychotherapist and writer of poetry and short fiction Tamsin Cottis about the important role reading and creativity plays in their therapeutic practice and teaching. Our library staff survey is now online – tell us what you think and help us make Reading Well as effective as possible for libraries. We are also looking for libraries to help us deliver our 2017-18 user feedback evaluation for Reading Well – sign up today to be entered into a prize draw to win a free collection of the new Reading Well for mental health titles! The new Reading Well for mental health booklist is now online. 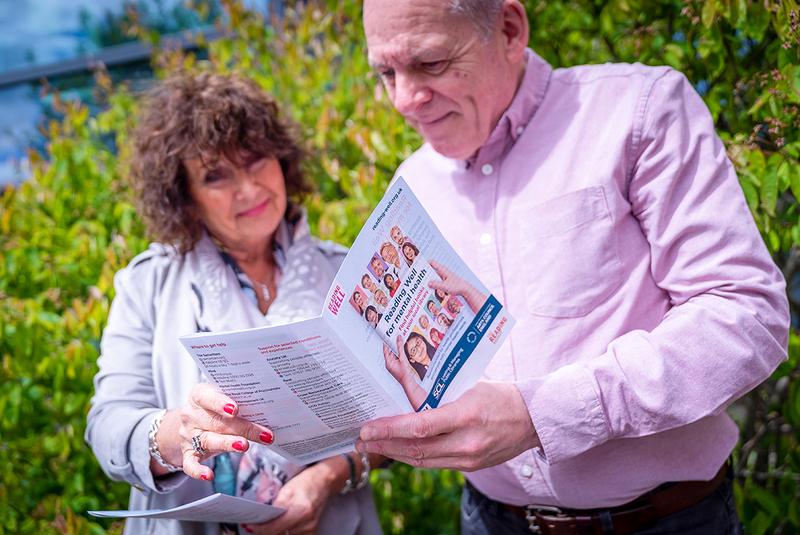 To see more photos from the national launch, browse #ReadingWell on Twitter.